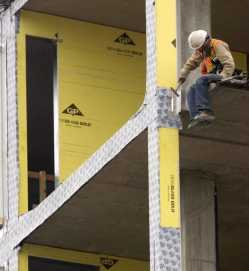 Don Ryan ~ Associated Press An unidentified construction worker hammered Friday on condominiums under construction in downtown Portland, Ore. U.S. employers slashed 63,000 jobs in February, the most in five years. WASHINGTON — Cracks in the nation's job market are deepening. Employers slashed jobs by the largest amount in five years and hundreds of thousands of people dropped out of the labor force — signs that the country is falling toward a recession or has already toppled into one. For the second straight month, employers got rid of jobs nationwide. In February, they sliced payrolls by 63,000, even deeper than the 22,000 cut in January, the Labor Department reported Friday. The snapshot of the country's employment climate underscored the heavy toll the housing and credit debacles are taking on companies, jobseekers and the economy as a whole. "It sounds like the recession bell is ringing for the U.S. economy, although it is still faint," said Stuart Hoffman, chief economist at PNC Financial Services Group. On Wall Street, stocks tumbled. The Dow Jones lost 146.70 points, a little more than 1 percent, to close at 11,893.69. The Dow was down 370 for the last two days of the week. The worsening situation will prompt the Federal Reserve to cut a key interest rate deeply — perhaps by as much as three-quarters of a percentage point — at its next meeting March 18, or possibly sooner, to help brace the teetering economy, analysts predicted. The shower of pink slips was widespread. Factories, construction companies, mortgage brokers, real-estate firms, retailers, temporary-help firms, child day-care providers, hotels, educational services, accounting firms and computer designers were among those shedding jobs. All those cuts swamped job gains at hospitals and other health-care sites, bars and restaurants, legal services and the government. "Losing a job is painful, and I know Americans are concerned about our economy; so am I," said President Bush. "It's clear our economy has slowed." The big question: Just how much? The weak employment report pushed an increasing number of private economists into believing the economy is probably shrinking now. Under one rough rule, the economy would have to contract for six months for the country to be considered in a recession. The unemployment rate actually dipped slightly from 4.9 percent to 4.8 percent, as 450,000 people left the labor force for any number of reasons. Economists thought many people probably gave up looking for work. "It stands to reason that a large share of the people left because they didn't feel like anything was there for them — that the market was too weak to be searching for a job at this point," said Mark Zandi, chief economist at Moody's Economy.com. To relieve persistent credit problems, the Federal Reserve announced Friday it will increase the amount of loans it plans to make available to banks this month to $100 billion. The Fed already has provided a total of $160 billion in short-term loans to cash-strapped banks since December. The Fed, in another step, said it will make $100 billion available to a broad range of financial players through a series of separate transactions. Crumbling employment conditions are feeding fears the economy will fall victim to all the stresses. Until recently, the positive forces of job and wage growth have helped to offset the negative forces hitting people from the housing and credit crises. Now people and businesses alike are more cautious, spelling more trouble for the economy. "The debate should no longer be about whether there is or is not a recession, only about how deep it will be," said Nigel Gault, chief economist at Global Insight. The elimination of 63,000 jobs in February was the most since March 2003 and marked the second month in a row of job losses. The last time the economy suffered two consecutive months of job losses was in May and June 2003, when the labor market was still struggling to recover from the blows of the 2001 recession. "Businesses got cold feet, and when that happens the easiest thing to do is to put hiring on hold and wait until the dust clears," said Ken Mayland, economist at ClearView Economics. Economic growth slowed to a near standstill of just a 0.6 percent pace in the final quarter of last year. Before Friday's employment report, many thought growth would weaken further — around a 0.4 percent pace. Now, however, a growing number think the economy is contracting. Bush's top economic adviser, Edward Lazear, acknowledged Friday that the economy may dip into negative territory in the current quarter. Lazear's comment was the most pessimistic assessment heard out of the White House. He would not discuss whether the White House believes the economy will actually fall into a recession. The Bush administration was hoping the government's speedily enacted economic stimulus package — including tax rebates for people and tax breaks for businesses — will help bolster the economy in the second half of this year. "I know this is a difficult time for our economy, but we recognized the problem early and provided the economy with a booster shot," Bush said. "We will begin to see the impact over the coming months," the president predicted. Democrats, however, said more relief is needed now. House Speaker Nancy Pelosi, D-Calif., spoke of charting a "new direction for our economy." Rep. Barney Frank of Massachusetts, chairman of the House Financial Services Committee, called for action to stem record-high home foreclosures. The Democratic presidential contenders, Sens. Hillary Rodham Clinton of New York and Barack Obama of Illinois, blamed the job losses on what they believe are failed Bush policies. "The news should put to rest any doubts that our economy is in deep trouble," Clinton said. Obama said the employment news meant "more heartache and struggle" for Americans. On the employment front, workers with jobs saw modest wage gains. Average hourly earnings for jobholders rose to $17.80 in February, a 0.3 percent increase from the previous month. Over the last 12 months, wages were up 3.7 percent. With lofty energy and food prices, though, workers may feel like their paychecks are shrinking. Spreading fallout from the housing and credit troubles are the main factors behind the economic slowdown. People and businesses alike are feeling the strains and have turned cautious. Adding to the stresses on pocketbooks, budgets and the economy: skyrocketing energy prices. Oil prices, which have set a string of record highs in recent days, now top $105 a barrel. Gasoline prices have marched higher, too. All those problems are putting consumers in a gloomy state of mind. Consumer confidence sank to a new low of 33.1 in early March, according to the RBC Cash Index. That was the worst since the index began in 2002. To help shore up the economy, Federal Reserve Chairman Ben Bernanke signaled last week that the central bank is prepared to lower interest rates again. Economists are now predicting a deep rate reduction by the Fed on or before its regularly scheduled meeting March 18. The Fed, which has been slicing the rate since September, recently turned more forceful. It slashed the rate by 1.25 percentage points during just eight days in January — the biggest one-month reduction in a quarter-century.